“Babasaheb Bhimrao Ambedkar is not only the architect of the Indian Constitution but he has also promoted a feeling of harmony which is an integral part of the Indian culture. Ambedkar always strove for unity and integrity of the country. He has framed the Constitution which has equality for all,” said State BJP President Rakesh Singh, while addressing a programme organised on Ambedkar Jayanti, on Sunday. Several programmes were organised across the State on the occasion of Ambedkar Jayanti. 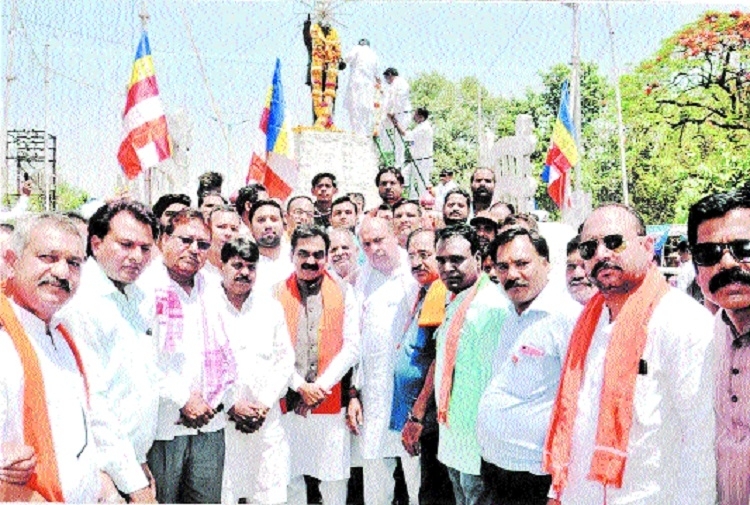 MP Rakesh Singh along with senior party leaders and workers reached Ambedkar Chowk and garlanded the statute of Babasaheb and paid floral tributes. Speaking on the occasion, Singh said that the Congress had always disrespected Dr Ambedkar and is making efforts to change the Constitution. Dr Bhimrao Ambedkar had told for temporarily implementation of Section 370 in Kashmir and he did not want enforcement of the same permanently. But the Congress has in its manifesto cleared that it will not abrogate Section 370 if it is voted to power. Likewise, the Congress also wants to repeal sedation law. Rakesh Singh alleged that Congress did not want to see Dr Ambedkar as minister, but when the Government was formed, it had to make Babasaheb Law Minister. Singh further said that Dr Ambedkar has given great Constitution to the country that promotes harmony and ends partiality. He said as per the Constitution the BJP will not allow repeal sedition law from the country. Likewise, we will also abolish Section 370 from Kashmir for uniformity in the country. Those present on the occasion were City President, G S Thakur, MLA Ajay Vishnoi, MLA Ashok Rohani, Anchal Sonkar, Dr Jitendra Jamdar, Abhilash Pandey, S K Muddin, Shivram Ben, Pramod Chouhtel, a number of senior office bearers and members of Anushuchit Jati Morcha of BJP.